The latest weather forecasts suggest the 64th Rolex Sydney Hobart will be a quick one. Fresh to strong, 20-30 knot northeast following winds for the first two days from the 26 December start will push the 100-boat fleet south at high speed under spinnaker. The predicted west-southwest change of 25-30 knots to follow will allow straight-line reaching courses towards Tasman Island, the last turning mark 41 nautical-miles from the finish. The sailing will be tough as the yachts speed south at speeds of up to 25 knots for the maxis and the mid-fleet and smaller boats will have to climb big waves in Bass Strait, but the conditions will be manageable for all. Nowhere in the forecasts - government and commercial - is mentioned the dreaded S-word, ‘southerly’, that on this 628 nm course, which crosses the notoriously rough Bass Strait, means strong to gale force headwinds and punishing waves. 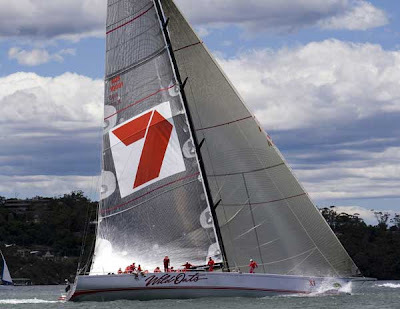 In this scenario, the fastest yacht in the race, Bob Oatley’s canting-keeled Reichel/Pugh 98 Wild Oats XI, could cut an extraordinary ten hours off the race record she set at one day, 18 hours, 40 minutes and 10 seconds in 2005 as well as taking line honours for the fourth consecutive year. But forecaster Roger Badham, who provides specialist services to a number of yachts in the fleet including Wild Oats XI, warns that the pace-setting big boats could be slowed by a lightening of the northerly flow as they close the Tasmanian coast on the afternoon and evening of Saturday, 27 December.